Kids can giggle at just about anything but something that is sure to get them going is the sound of passing gas. Gas Out is a children's game where they will have hours of fun playing this simple card game trying to avoid the farting Guster. If you can escape it during your turn you'll be the winner. 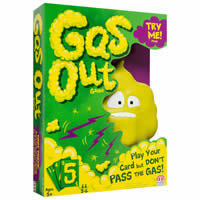 Gas Out is good for up to six players and is intended for younger kids five and older. Guster, the electronic gas cloud, takes two AA batteries so be sure to keep some on hand. Game play is fairly straight forward and easy for kids to understand how to play. We have the official game rules below if you need to download them or reprint them out. Tell us what you think about Gas Out and purchase this game today. If you can be the last player to keep Guster the gas cloud from farting during your turn you win. Your game will come with one Guster (the electronic gas cloud), 56 Gas Out cards and the official Gas Out game rules and instructions. Please keep in mind that the official Gas Out childrens rules and instructions could be different depending on the game version you have. The rules below are some of the exact directions on how to play Gas Out. Share with us your comments, funny stories, tips, advice, strategies, creative ways to play, questions about how to play, problems with the rules or anything you want about Gas Out. All submissions will be reviewed within 24 hours. Click here to add your Gas Out comments. I saw this at the store and couldn't believe that someone made a game like this - so, I had to buy it. :) Kids loved it and it was fairly amusing to play.